Cairo, 31 July 2018: – The recent Annual Meetings of the African Export-Import Bank (Afreximbank) held in Abuja saw the emergence of a new African construction entity, Mota-Engil Nigeria, positioned to catalyze growth in the local market by focusing on execution of construction contracts and trade enabling infrastructure. The emergence of Mota-Engil Nigeria is the result of a joint venture agreement between the Shoreline Group and Mota-Engil Africa, a subsidiary of the Mota-Engil Group. 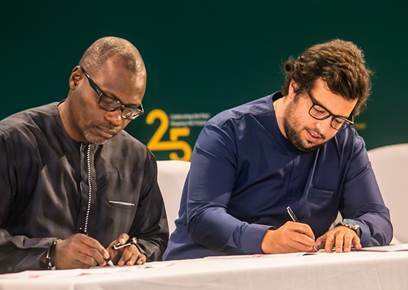 Kola Karim, Chairman of Shoreline Group, and Manuel Mota, Chief Executive Officer of Mota-Engil Africa, signed the joint venture agreement on the sidelines of the Afreximbank Annual Meetings during a ceremony facilitated by the Bank which had also been retained by the Shoreline Group to serve as financial adviser for the transaction. Under the terms of the agreement, Shoreline will get 51 per cent of the interests in the new entity while Mota-Engil Africa will keep the remaining 49 per cent. Mota-Engil Nigeria is being positioned to become a reference operator in the engineering, procurement and construction sector and will leverage the network and capacity of its parent companies to compete in the development of critical trade enabling infrastructure in Nigeria and sub-Saharan Africa. Speaking during the signing ceremony, Amr Kamel, Afreximbank’s Executive Vice President in charge of Business Development and Corporate Banking, said that Africa was the major beneficiary of “this great alliance of two industrial colossuses for development of trade enabling infrastructure and facilitation of intra-regional trade in the sub-Saharan region”. According to Mr. Kamel, the joint venture is aligned with Afreximbank’s medium-term strategy, especially as it relates to the promotion of intra-African trade as well as to industrialization and export development. Witnessing the signing ceremony were Aisha Abubakar, Minister of State for Industry, Trade and Investment of Nigeria, and Nasiru Wada, who represented Lamido Sanusi Lamido, Emir of Kano, Nigeria, and Chairman of Mota Engil Nigeria. The Shoreline Group, founded in 1997, with head office in Lagos and an additional office in London, has operations across sub-Saharan Africa. Its portfolio of 16 operating companies, with more than 3,000 employees, includes Costain West Africa, Shoreline Power, GASLAND and TAFL as well as others in the oil and gas sector. Mota-Engil Africa, with more than 11,000 employees, is a major engineering and construction company and part of the multinational Mota-Engil Group whose experience in the construction industry dates back more than 70 years. The Mota-Engil group also operates in North America and Europe and has significant engineering business presence in Latin American. The Afreximbank Annual Meetings and 25th Anniversary celebrations took place in Abuja from 11 to 14 July.